We drove from Niagara Falls to Lake Placid. We ate dinner at Eres Pizza. Their new york style pizza was very tasty and went down nicely with a pitcher of Yingling. Later we went to the Lake Placid Brewing Company. Their winter lager is excellent. It was a great day of skiing at Whiteface today. The sun was out and the views were amazing. It usually is hazy or snowing heavily so I never saw the scenic views on the prior trip. Whiteface even had the downhill slalom open to the public. There is a rubber wand you hit when you start off the platform. When you finish you break another sensor and your time lights up on the big board. My first time was 31.07 and my last time was 25.72. Doug and I spent several passes working on improving our times and distracting our bodies from the soreness of the prior day of skiing. Heather rode the bob sled in the afternoon. Doug and I did the skeleton in the evening. It was very exciting to have your face a fist height off the ice. I hit 43 MPH on my pass and Heather videoed the closed circuit video loop. The video shows off the intensity and speed of this sport. It was another great day of skiing. It was extremely cold with a high at the bottom of the hill of zero degrees. Very few people were out allowing for skiing onto the lifts and gondola. Doug and I especially enjoyed the Lookout Mountain addition. The Wilmington (blue) run offers a diversity of terrain (over 2.5 miles) while treating you to inspiring scenic views. I stopped at the Great Adirondack Brewing Company for a sampler after shopping for Mandy’s gift. My favorite is the Abbey Ale. I joined Doug and Heather at the Lake Placid Brewing Company for dinner. Their shepherd’s pie is very hearty on such a cold night. We arrived at the Le Blanc and were greeted with cold scented towels,flowers for Mandy and fresh coconut milk. The lobby had a lavish scent, breathing in had the effect of relaxing your whole body. During check in we were offered margaritas which we accepted. Our butler explained how everything worked in our amazing room. That evening we ate at the Blanc Italia. The meal started off with a collection of breads, water garnishes of cucumber, lemon or lime, and a welcome appetizer. The meal was superb. When we returned to our room they had relaxing music on, chocolate deserts ready to eat, slippers out next to bed,and our bed turned down with fresh chamomile pillows and bath robes hanging by the shower. 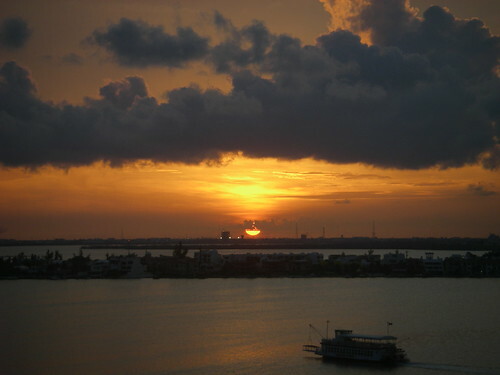 Our room overlooked the lagoon and we enjoyed the sunset. Later we went had some drinks at the Blanc Stage and played foosball. I enjoyed the top notch BlackFitness facilities. I worked off several hundred calories in preparation for breakfast. At breakfast waiters carried our plates for us and we gave the special mixed fruit drink of the day a whirl. The breakfast buffet was amazing with lots of unique items to try. We went swimming and enjoyed the beach and of course some fu-fu drinks. We returned to cold towels and the lavish scent of the Le Blanc. 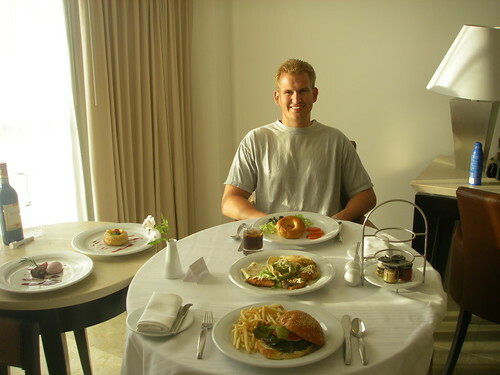 We had room service for dinner. The Mexican appetizers and the chocolate sponge cake were excellent. We walked around outside until the mosquitoes had deterred us. I didn’t see the giant lizard since I had the camera ready this time. We ran into biologist Sue and she asked if we wanted to participate in turtle release. We each released three loggerhead sea turtles. As soon as the turtles hear the water they start running right into it. There was one turtle that was confused and kept running away from the water. Since flash photos were prohibited we didn’t take any photos. 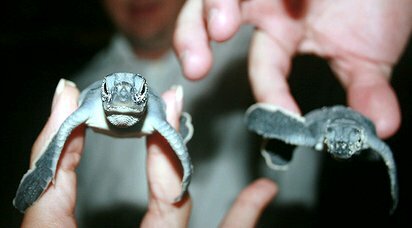 But on Flickr I found someone that blinded their sea turtles to get a good photo. We went back inside, listened to the accomplished violinist and enjoyed some fresh coconut milk. Later we went to salsa lessons and had a blast. Note to self, take small steps and eliminate the bounce. When we returned to our room it was well attended too and some new chocolate treats awaited us. I got up early and went to an individual yoga lesson inside the open air hut overlooking the lagoon. There were pleasant nature sounds and no mosquitoes. The yoga class lasted almost an hour and was demanding given my lack of flexibility. The instructor, Ricardo, did a great job and wished me a “happiful” day. Another amazing breakfast followed. We went to Wet & Wild for the day. This water park was free since it was also owned by Palace Resorts. Drinks and food were included. I especially enjoyed the banana monkey mixed drink. Water parks are even more enjoyable through the lens of free alcoholic drinks! Strangely the tubes for the lazy river were not included for free, but it was still enjoyable to ride along on it and it was so much less crowded than in the states! We returned to cold towels and the lavish scent of the Le Blanc. The Blanc Orient restaurant had slow service and they were out of most of the sushi on their menu. The ahi tuna appetizer was delicious and very generous. Later we went had some drinks at the Blanc Stage and played more foosball. Breakfast was delivered on time, hot and delicious. I saved some of the massive amount of toast for feeding the fish in the lagoon. 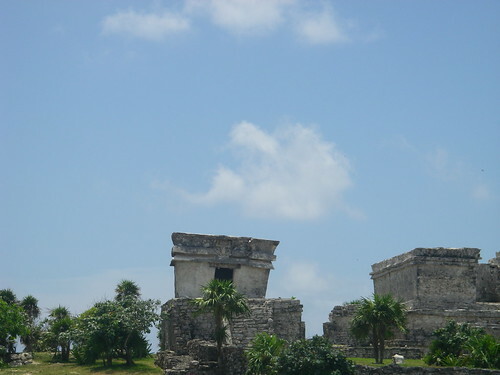 We went to Tulum, a walled Mayan port city with beautiful beach. 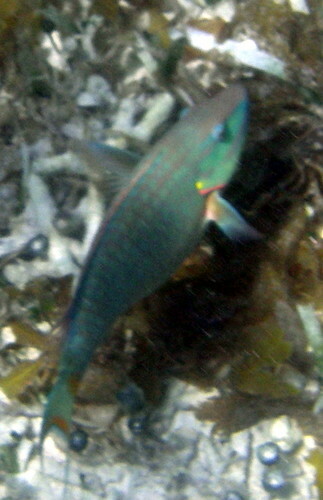 The beachhead was protected by reef except for a 120′ opening for commerce. Recent hurricanes didn’t damage Tulum since buildings have no 90 degree angles, allowing wind to pass. Perhaps, New Orleans should take note? Hurricanes wash artifacts up on beach and they prove the citizens participated in long distance commerce since the closest turquoise is found in New Mexico and Arizona. Mayans used lime to pave roads. Lime is a natural pesticide and this allowed for nighttime commerce since all freight was carried on backs of the people. Remember that horses were not available. Mayan buildings were made of stone that absorbed the energy of the sun and became golden. When Cortez saw the city he wrote it was made of gold. Coco beans were used as the local currency, hence the saying, money growing on trees. 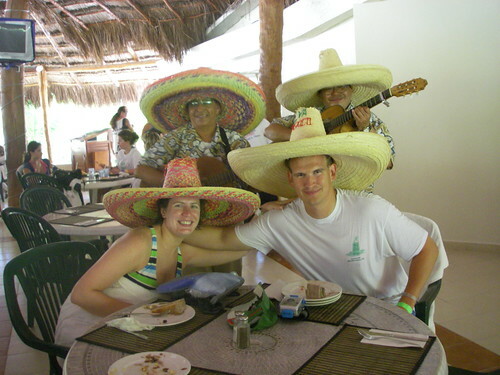 That afternoon we went to the Xpu Ha resort for a cattle call lunch buffet with poor service. There were kids everywhere which was much less relaxing than the adult only Le Blanc. We went snorkeling and saw a barracuda and a few other fish. We enjoyed the beach even though it was very rocky. 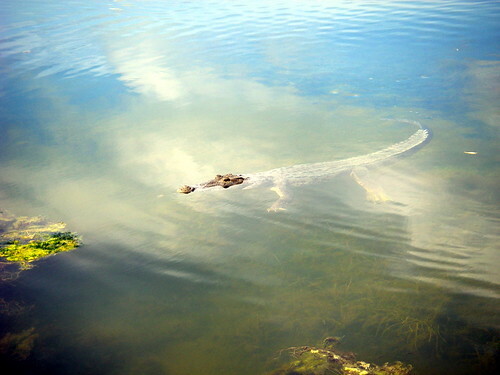 The Xpu Ha nature preserve had deer, turtles, crocodiles, monkeys and catamidi. We returned to cold towels and the lavish scent of the Le Blanc. We had a seven course dinner on the Blanc Terrance overlooking the beach. There was a nice breeze and the main course was a steak stuffed with lobster. Each course was matched with a nicely selected wine. Later we had some drinks at the Blanc Stage and enjoyed the end of the magical show. After dinner we ran into our friends from California at the lobby bar. We did a tequila tour: Tres Generations, Don Julio, Don T., 1921, etc. Breakfast was delivered on time, hot and delicious. 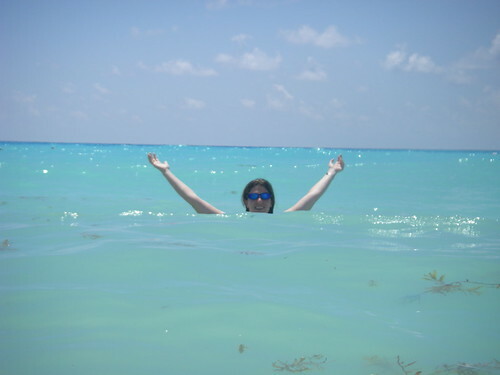 We took a bus to Paradise Snorkeling at the El Dorado Maroma. The atmosphere reminded us of the El Dorado Seaside Suites we visited last year. We rode a catamaran sailboat out to the Palencar reef to snorkel on the 2nd largest reef in the world. The guides fed the fish and we saw lots of topical fish. Mandy saw a large sting ray. 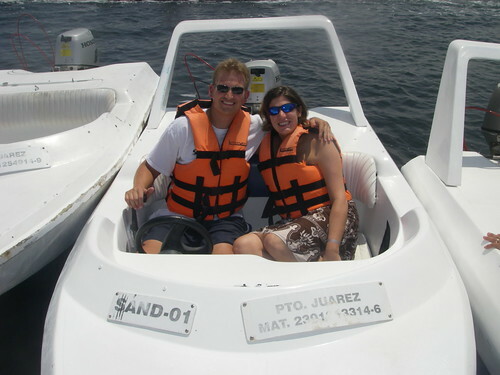 We did the optional Jet Ski excursion for $91 per person. We Jet Skied to a cenote that terminated in the sea. Fish gathered to eat at the cenote and the water was noticeably cooler as fresh water was entering into the sea from it. The Jet Ski was fun in the rough and windy conditions but I definitely would not want to own one. There were no mishaps but we did get air a couple of times and Mandy nearly flew off. The Mexican lunch buffet was tasty and the service was much better than at the Xpu Ha buffet. We were serenaded by Mexican hat performers. We returned to cold towels and the lavish scent of the Le Blanc. We had dinner at the Blanc International restaurant. We stopped at the hotel lobby bar and talked with some honeymooners. We tried Casadores tequila and rumor has it that our friends drank the Le Blanc out of it. We learned that King Bush II vacationed at the Le Blanc a couple years back. 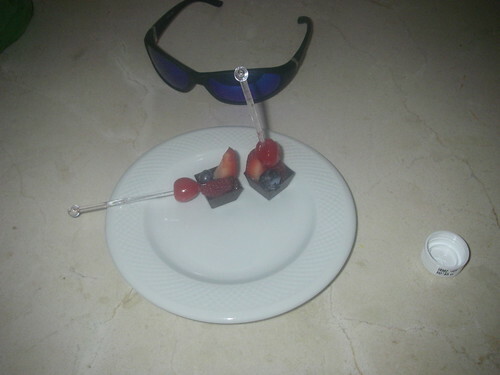 We returned to our room to find delicious chocolates with fresh fruit. I started the day by worked off 550 calories. We went to breakfast at the Blanc International. 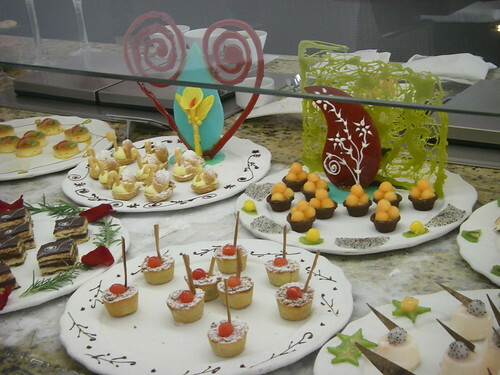 The scrupulous food sculptures were amazing. We enjoyed the pool and ordered a tasty nachos platter. We did the jungle tour again in the afternoon. 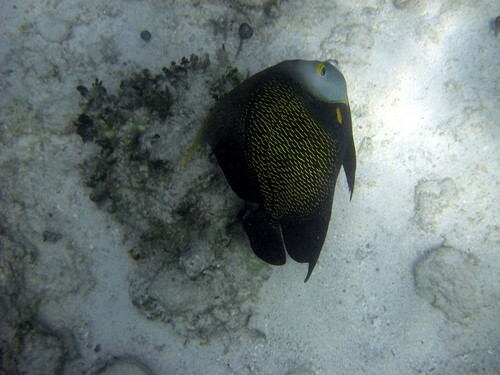 There were a lot less people and we saw an amazing amount of fish we never saw before while snorkeling. Mandy drove the speedboat well. Another couple crashed their boat several times into the shoreline and broke off the rear wing. We returned to cold towels and the lavish scent of the Le Blanc. 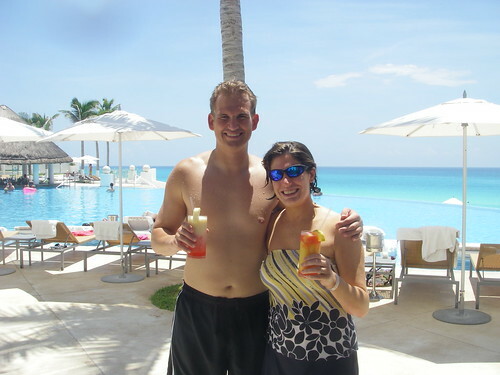 We relaxed around the pool and enjoyed margaritas made with Don Julio. 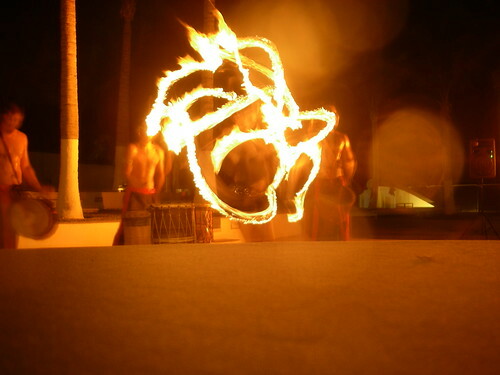 We had dinner at the Blanc Italia where they made us a surprise second anniversary dessert and then we enjoyed the fire show. I captured this impressive show on video. We stopped at the lobby bar for some lemon drop shots and I enjoyed a Drambuie on the rocks. Bar was still out of Casadores tequila… Later we had some drinks at the Blanc Stage and played more foosball. We upgraded our pillows to rose and lavender aromatherapy ones. I started the day by worked off 175 calories. We both got up early and enjoyed a personal yoga session with Ricardo inside the open air hut overlooking the lagoon. Mandy saw a crocodile in the lagoon. We had a refreshing breakfast at the Blanc Terrance. The Mexican breakfast was stout! We relaxed at the pool and enjoyed the nacho platter. We had a light lunch at the Blanc International. 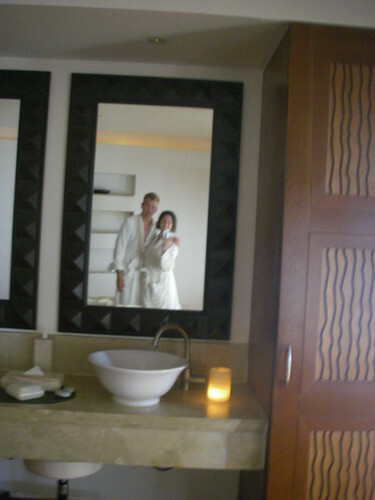 We arrived one hour early at the spa to prepare for our couple massage. Preparation entailed shower, sauna (10 minutes), cool towel, steam room (10 minutes), cool towel, shower, foot massage hot tub, full body hot tub, pool of cool water (3 minutes). The 80 minute full body aromatherapy massage was amazing. The pressure points on my head and hot rocks on my back and hands were my favorite parts. I think Mandy picked natural rose oils for us. We were served hot tea afterward and my body felt so relaxed and like new. We sat in the relaxing area at the spa for a long time. 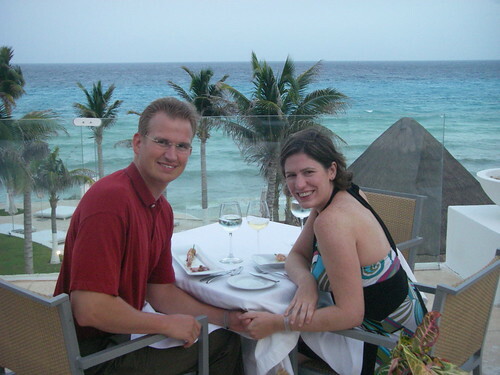 We had a seven course dinner on the Blanc Terrance overlooking the beach. Later we had drinks at the Blanc Stage and enjoyed the jazz band and played some pool. I started the day by worked off 120 calories prior to yoga. We both got up early and enjoyed a personal yoga session with Ricardo inside the open air hut overlooking the lagoon. We had breakfast at the Blanc International and ended with a selection of delicious ice creams. We feed the fish in the lagoon with all the extra bread I saved. We saw several neat jelly fish. We swam in the lagoon swimming pool and talked about the Nephilim and Dec 21st, 2012 with Susan See from Arkansas. Robert and Susan own a fish market and were treated to the Le Blanc by a vendor. They were part of a huge group! By the way, I am not into end of world theories, but we had an interesting conversation. Mandy and I swam in the ocean and enjoyed the infinity pool one last time. We ordered lunch pool side. We even had box dinners packed to eat at the airport while we were waiting for our flight. Yummy! We had a direct flight to Detroit and avoided going through customs at a connection airport and the whole madness of retrieving our luggage, repacking duty free items, going through passport controller, customs and security again! We arrived late into Detroit and with no other international flights landing passed through quickly. We left from Findlay hoping for a relaxing and low key week of snow skiing at Lake Placid. Per the GPS, aka our brain, we were well ahead of schedule until we entered the eastern Cleveland snow belt. My red TDI Jetta, aka the Red Devil, did not meet winter traction expectations. Even with my driving prowess, the heavy snowfall required us to slow down and very quickly the GPS started tormenting us with a later projected arrival time. Then the Red Devil decided to develop serious transmission issues. The Red Devil is a 5-speed manual and I lost the ability to shift. We were forced to pull over. We talked nice to the Red Devil and were able to get her moving again. We pulled off in Erie Pennsylvania in the middle of a whiteout and investigated further. I put Doug behind the wheel since he is an excellent driver with legendary skill at escaping from fiascoes. Houdini would be proud. Luckily he got her moving again up a vicious snow-covered hill without the aid of 1st gear. Thankfully diesel cars have a ton of torque. We continued on to Buffalo for lunch at Famous Dave’s BBQ and I fired up my computer and started reading the VW forums. We stopped at Wal-Mart to purchase additional clothing and the auto parts guy was completely clueless. We barely got the car going again and called my friend Jason. He is a premier Ford engineer and he happened to have a master mechanic with him. We interrupted their 10.5-hour gambling seminar in Vegas and they had a good laugh at our expense. They weren’t sure we would make it and thought the only way we could keep moving was power shifting. Doug picked up quite a knack for power shifting and I told him our shift count was limited to the number of digits I have. We were still ~400 miles from our destination. Stopping to pay our toll at the Syracuse toll booth disabled us completely and we thought it was game over. However, like rebooting a windows computer we got the Jetta going again. We started in 2nd and changed gears into 3rd and 4th. We made it to Watertown NY with only 4th gear. We finally stopped to top off the fuel at Jet Gas (the only store with diesel). Unfortunately, Marathon doesn’t sell fuel in NY State. This vintage station had a tidy little bathroom with a depression era light switch. More fun starting off and soon we escaped town. Doug commented it was smooth sailing. Heavy snowfall soon developed and the road was completely covered and visibility was limited. It is much more difficult to drive in heavy snow especially on twisty Adirondack Mountain roads. Luckily we caught up to a snow plow truck and followed it for many miles. Not too long after the snow plow turned off, we were pulled over for having no tail lights and the officer was polite but firm in his resolve for us to remedy this problem. We had him call a tow truck and we waited and waited and waited. Doug had time to take two separate pit stops. I requested that the tow truck be a flatbed but we got an ordinary wrecker with a good old boy driver. He towed us to a repair shop that just happened to be open at 9:00pm on a Saturday evening and was less than a mile down the road. He got the tail lights working by jiggling them and we were on the road again about 1.5 hours away from Lake Placid. Snow was even heavier and Doug imagined where the road was. We barely limped into Lake Placid, but we made it! The world cup was in Lake Placid. As a consequence, it appeared that no hotels available, but with a high-speed cellular internet connection we found a room at the Econo Lodge. However, I discovered I lost my only credit card and this complicated making the reservation. Six drunken guys propelled the Red Devil down a hill to get her started in Lake Placid and after a little navigation difficulty, we found the Econo Lodge. They didn’t think we had a reservation at the front desk and their computer was down. They found a room and we went there ready to crash. However, the room was still un-clean from the last patrons. Fortunately, they had one more room for us to try and it was perfect! One Woodford Reserve (courtesy of the Intercontinental) and Coke for each of us and we were ready for bed. The sun came up the next day and it was a beautiful day. I called Famous Dave’s BBQ and they had my credit card. It is always good to leave waiters generous tips in case you leave your card behind. Russ and crew were behind us and picked up the card for me. I worked out a couple possible options for repairing the Red Devil. The VW / Audi dealer option required a ferry boat ride into Vermont. Doug and I have problems with ferry boats, but that is a story for another time. It was several days before any repair shop could evaluate the Red Devil. We started the Jetta in 2nd for the trip to the condo. I had to help push the Jetta up a hill due to traction problems. Since we couldn’t use the clutch anymore I had to jump into the moving Red Devil. Luckily, we made it to the condo we were staying at for the rest of the week. Our condo wasn’t available so we walked downhill to the convenient Lake Placid Pub & Brewery. Doug and I tried their beer sampler and my favorite was the Ubu ale. Of course, I had to have a full pint of the Ubu ale while I enjoyed a hearty shepherd’s pie. The condo people called and our unit was ready. It was a large and impressive condo with a 42″ LCD TV, sauna, and tall fireplace. Doug and I chilled out until Rusty and crew joined us later that night. Apparently, they took a scenic path. We still had time to play some rock band. I was the weakest link and really didn’t have the hang of it. We skied at Lake Placid the following day. I added some drama by misplacing the lift ticket receipt but I eventually found it in my ski jacket. I warmed up on the green and blue runs off the new Face Lift. Rusty, Doug, and I took the gondola to the lesser summit and I enjoyed some very long blue runs. Later, we went to the greater summit. The view was amazing from the summits. I skied without falling which was amazing given the way the trip was going. The Red Devil was towed while we were on slopes. I hoped that she would be fixed for the return trip. For dinner, we ate at Pete’s Steakhouse and the food was okay. Tuesday, we took the Lake Placid Olympic Tour with Mr. Rogers. He was a walking encyclopedia of winter Olympic history. It was a great tour topped with a stop at the rink where the “Miracle on Ice” took place. Touring the Olympic venues provided a fun recovery day. Doug and I were pleased with the good, plentiful, and reasonably priced food at Wise Guys. I persuaded Doug to do a little wine tasting and for $3 we tasted eight wines and had a souvenir glass to take home. The next stop was the Steak and Seafood micro-brewery. Their beer sampler included eight four-ounce samplings featuring two seasonal specials. I really liked their Abbey Ale and Barley Wine (11% alcohol beer). I even talked to their brewmaster who was a cool cat. Wednesday, we skied again (for $35 by providing a Coke can). The runs were covered in fresh powder from steady flurries all night. No injuries were logged. Thursday, Doug and I took a bobsled ride and it was quite a rush. (It is definitely an experience to put on the list of 100 things to do before you die.) We traveled down the bottom half of the Olympic track and reached 50+ MPH. We also visited the ski jump complex. Friday, we skied for $30 since it was Whiteface’s 50th anniversary. I ventured down some black diamonds and only fell once. We also picked up the still broken Jetta since the parts to fix it weren’t readily available. While returning to Lake Placid a small town had a fire that closed their downtown and forced us up a very steep hill. Of course, Doug was forced to stop at the top and I stopped Rusty’s Jeep four car lengths back. Every time Doug tried to take off he slipped backward. He cleverly used the Emergency brake to hold his position while the spinning tires melted the ice and eventually provided enough traction to proceed. Later, we stopped back at the Steak and Seafood brewery and the brewmaster gave Rusty his Barley Wine recipe. Rusty promised some of his future batches. We left Saturday for home and hoped to reach Batavia where I had a Holiday Inn booking. We took a different route with less stop and go. The scenery was even better. Unfortunately, we decided to get cocky and take a shortcut. The shortcut shaved mileage but cost us lots of stops and go traffic without a working clutch. It would definitely have been better to stay on the interstate. We barely made it to the Holiday Inn and the starter pulled us out of the toll booth and across the street to the Holiday Inn. The following day we completed the trip home. Doug did all the driving home and he deserves a big thank you. This past weekend Doug and I headed up to Big Powderhorn Mountain to go snow skiing. We originally planned to travel to a closer resort but there was either no snow due to the unseasonably warm conditions or freezing rain predicted. Our first choice was Whiteface in upstate New York. However 3,430 feet of vertical drop with a base covered by freezing rain didn’t sound very safe (considering our snow skiing skills). We traveled to Marquette Michigan and stayed over night on Thursday evening. The Holiday Inn in Marquette has a huge pool and hot tub, which was especially appreciated after such a long drive. Marquette is really nice city right on Lake Superior. The UPers were very friendly and warned us about the trolls that live below the Mackinac Bridge (i.e. in the lower peninsula of Michigan). Doug liked the UP a great deal and didn’t hold it against them that they were part of Michigan. Friday we finished the drive to Big Powderhorn Mountain and checked in. The resort was a ghost town (since it was the weekend after New Year’s weekend). We were allowed to check into our chalet early, which was older but very nicely maintained with fireplace and hot tub. We skied until the slopes closed at 4PM, which seemed pretty early, considering it was light until at least 5:15. We drove over to Copper Peak to check out the huge ski flying jump (which is the largest ski jump in the world). It looked like it wasn’t well maintained and a bit of an eye sore so I didn’t take any photos. For dinner, we went over to the Black River Valley Pub & Grub for their fish fry and their grilled catfish special was excellent. They even had a live band which was definitely the best cover band I have heard in a long time. Saturday, we skied another full day. Ask Doug about his shortcut between hills that we had to slave around a lake and back up hill. He lost his pole and had to do it again! Conditions were slightly icy but not bad. A bad day of skiing is still better than a good day at work. For lunch we ventured to find the Powdermill Tavern (which was within the Powdermill Inn) despite all the advertising for $3 pizzas nobody seemed to know where the place was. We finally found the Powdermill Tavern and almost left thinking it was closed due to lack of patrons. It was beautiful three story wood bar that was past its prime. We learned quite a bit about the area from the bar tender while we drank our beers and eagerly awaited our pizzas. The area was a mining mecca back in the day. Most of the iron ore for WWI and WWII came from this area. The ski jump we visited wasn’t maintained and Copper Peak has tons of copper but not in high enough concentrations to make it economically feasible. The loss of mining hit the area hard and the transition to a vibrant winter sports destination was very welcome. There used to be snow November – April making for an ideal snow season. However, in recent years they are lucky to have snow by Christmas and it will melt off by mid-March. This explained the plethora of real estate for sale in the area. I wonder what will be the next economic boom for this area, especially since 2007 is predicted to be the warmest year on record. Sunday, we ventured back and completed the drive in 10.5 road hours as measured by my A6. Recently I traveled to New Orleans for work. Meredith took some photos of the French Quarter. I stayed at the Royal Sonesta at a very reasonable $89 / night, which included a balcony on the corner of Bourbon and Conti. I can only imagine what this room would have cost pre-Katrina. I figured that spending money in New Orleans was the only way to help the local economy. Once you get outside the French Quarter area things are still devastated and I didn’t have the courage to attempt to check out the 9th ward. I finished listening to Snow Crash on audio book and was enthralled by the exciting high tech story. Currently I am listening to Adventure Capitalist which is an interesting combination of travel and investing. Mandy also gives it a thumbs up. I put a few photos from the Lake Cumberland 2005 houseboat trip online. 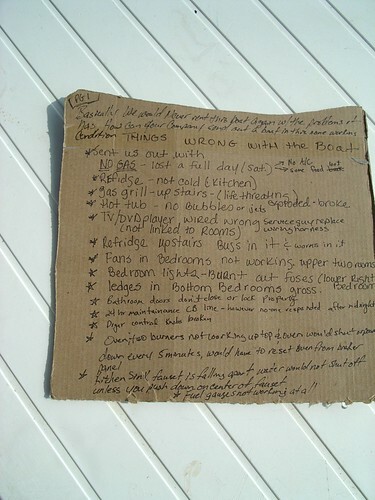 Read the problem list we kept to document all the problems with the SS POS (850) we rented from State Dock. Hopefully, you find our adventure humorous. I was happy to return to work and looked back upon this experience as sort of like being on a bad reality TV show based upon house boating in Kentucky. We took possession of the SS POS (850) and proceeded to navigate it across Lake Cumberland to the slalom courses past Girder Hill marina (which is quite a haul). We parked the houseboat in a nice cove with close proximity to the slalom courses. We skied until almost dark and returned to the houseboat for a relaxing dinner and looked forward to a dip in the hot tub. My comrades tried to light the upstairs grill and there was an explosion which resulted in fire coming out the sides and top of the grill. Luckily, Doug stepped back when the flames violently spewed out the front of the grill almost singed his swimming trunks and personal equipment. Fortunately, we had a second grill on the first floor and found another brave soul to light it. The other grill fired up without serious incident and we were off to the fridge for some meat. That is when we noticed that the fridge seemed to be unusually warm. We figured that the huge amount of food that we piled into it put a load on it and fixed dinner. After dinner we decided to watch a little satellite TV. However, the tall cliffs surrounding the cove our houseboat was positioned within blocked the sky from the auto-tracking satellite dish. This wasn’t an issue since we just wanted to watch a little satellite TV to show off how fancy a houseboat we rented for ourselves. We decided to play a DVD instead and loaded the player. However, the DVD player would not feed the TV. Therefore, the large TV and surround sound system were neutered useless. It was definitely time to consult the ship-to-shore radio for assistance. The folksy Kentucky drawl on the other end helped us reset the fridge circuit breakers and promised to send help out the following day to get the DVD player and grill working. We were thankful for the help and were reassured for the moment. However, the fridge circuit breaker flipping off almost every hour left us a little uneasy since we came prepared with enough food for feasts every meal. Not to be deterred we decided to entertain ourselves with some Texas Hold’em. Those not electing to play Texas Hold’em went upstairs to relax in the hot tub. The hot tub was hot but describing the jets as anemic would be an understatement. I have seen picnic baskets more powerful! After a while the generator sputtered and eerily died. The AC kicked off, the hot tub stopped, and the lights fluttered. The battery system on board was only large enough to run the lights and fridge for a couple hours. We tried to re-start the generator to no avail and concluded that the generator was out of diesel fuel. We began theorizing as to how this could have happened since the tanks are large enough for the houseboat to be out a full week without needing a fill up. Nick and I checked out the Houston Rodeo last night. It was definitely the most entertaining rodeo I have ever been too. I guess the saying that everything is bigger and better in Texas holds true. The rodeo events were right after one another and involved very little dead time. Each night of the Houston Rodeo has a major performer to close the evening (at the Reliant Center). We had the privilege of seeing the Steve Miller Band perform. It was a great show and we were struck by how professional Steve Miller looked. He was clean cut, dressed in a sports coat, and definitely didn’t have the washed out drug look so prevalent in musicians of his era. He could have walked into any building in Houston and fit right in. Steve Miller and his band had engaging stage presence, solid chops, and delivered all their great songs. After finishing up their set with “The Joker”, fireworks were launched to finish the evening with an exclamation point. Yesterday, Doug and I went down to Mad River Mtn. near Bellefontaine Ohio. Mad River Mtn. had a solid base (46″-52″) of snow from the recent winter storm and some help from nightly snow making. I was excited to use the set of skis I received for Christmas. Doug and I found the slopes very easy. Doug went to Lake Placid (where the Olympic team practices) last week. He noted that the green hills (i.e. the easiest) at Lake Placid were more difficult than the double black (i.e. most difficult) at Mad River Mtn. Mad River Mtn is a good place to learn to ski but its downhill challenges are easily overcome. None-the-less we had a good time. We even ventured over to the fun park which included ski jumps, grinds, and obstacles. Doug and I tried out the ski jumps. He did pretty good and I took a solid crash.